I saw this in HMV the other day. 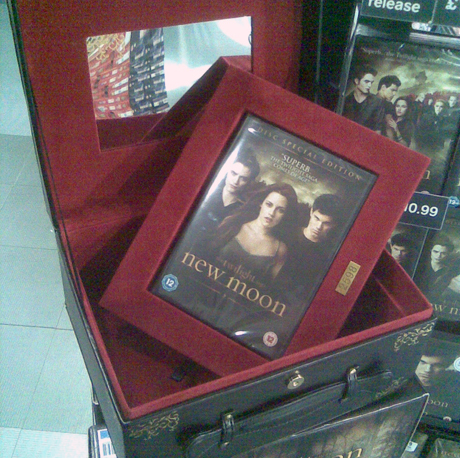 It’s a New Moon Limited Edition Memory Box and it retails at £99.99. This highly exclusive presentation box is beautifully finished in luxurious PU black leather with gold foil text and scrolling and a red velveteen inner with mirror. It has plenty of space to store all your treasured Twilight Saga possessions and also doubles up as a great vanity case. You can take it with you or keep it in pride of place at home. Each exclusively numbered case contains your very own copy of the The Twilight Saga: New Moon 2 Disc Edition, packed full of extras. With only 5,000 in existence (exclusive to the UK) it’s a must have for any Twilight fan. Unfortunately, what they’ve failed to mention is that it’s actually a tacky piece of crap with a £7 DVD inside.